Like wheelchairs themselves, wheelchair accessible vans, or WAVs, come in all shapes and sizes. When you first begin considering how you’d like to fit your wheelchair into a vehicle, you may find yourself overwhelmed by the options available. One thing is simple, though: if you purchase a vehicle through a mobility dealer certified through the National Mobility Equipment Dealers Association (NMEDA), you will be presented with the safest and most reliable accessible vehicles on the market, and the service technicians there will be specially trained to work on your equipment over its lifetime. At United Access, we are proud to offer the best care for you as our customer from the moment you roll through our front doors to the day you leave in your new vehicle. Our company-wide commitment to strong customer service means that the UA team is always ready to assist you – even if it’s in the middle of the night. Many of our customers have used our 24/7 Emergency Service Hotline when their conversion or equipment malfunctions after hours. Additionally, we understand that a wheelchair accessible vehicle must be easy to operate for it to fully grant you the independence you seek. If you’re exploring wheelchair accessible minivans, you’ll find that the lowered floor and ramp offers easy access for wheelchair and scooter users; once the van “kneels,” you can maneuver directly into the van, exerting little effort. 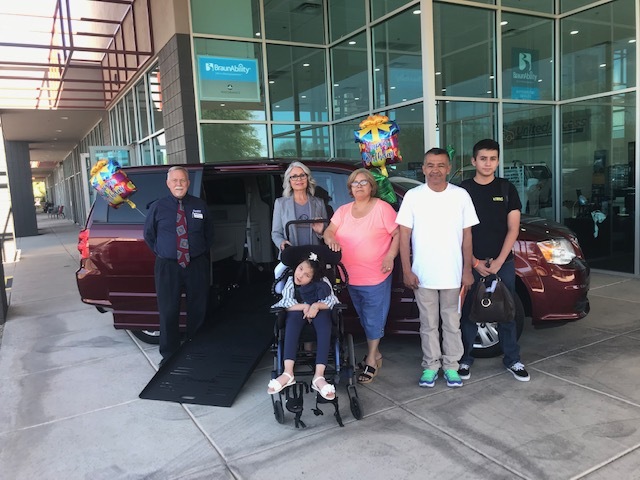 Moreover, since the minivan’s two front seats are removable, you have the option to ride or drive without having to leave your wheelchair. All members of the UA sales team are certified mobility specialists. Due to their extensive training and familiarity with all kinds of conversions, they are your best resource. Mobility specialists will take the time to speak with you and learn about the nature of your disability and your everyday needs. Once they help you identify the best options for you, they will then discuss funding and financing options. Each United Access store works to identify national, regional and local funding sources, including grant programs offered by non-profit organizations. We understand the ins-and-outs of entities like the Veterans Administration (VA) and each state’s Department of Vocational Rehabilitation (VR); our familiarity with the forms and processes required by those funding sources will make it much simpler to secure funding for your vehicle modifications. All in all, when you buy from a NMEDA-certified dealership, the quality of the product from the manufacturers that we are licensed to sell far surpasses anything that you will find elsewhere. The United Access team stands behind the vehicles that are on our lots across the country. Only a certified mobility specialist can truly identify the right type of vehicle to truly transform your life. Once you have picked your certified wheelchair van, the next steps are just as smooth and easy. Your mobility specialist will help you decide if you need any equipment for example a transfer seat or lock down for your wheelchair. Another reason that you will want to buy your van from a certified dealership such as United Access is that our service departments provide top notch installations. There are distinct types of driving aids to assist your ease of driving your new mobility van. From low effort steering to hand controls, our certified technicians can fit these adaptive driving options into your vehicle for you. Each United Access location has a certified service department to address any warranty needs or other service issues that you might have. The service technicians are highly accomplished with most having extensive experience in the mobility industry. This type of quality is especially hard to find when going to a dealer that is not certified in the mobility vehicles and equipment. You will want to always consult with a certified dealer for the peace of mind that you are getting the best care and quality. United Access is the best choice for excellence in customer service and to find the specific mobility equipment to meet your needs.